"Why Shakespeare? Indeed!" is our core curriculum created for the curious adult, the homeschool family, and all who hunger for knowledge. "Why Shakespeare for Kids? Indeed!" takes some of the core curriculum and presents a firm foundation to build on for study when a child grows older. "Why Shakespeare? Indeed!" Lapbook kits. These are especially created to enhance enjoyment and retention of the curriculum. “Why Shakespeare?” Indeed! : An Enrichment Study for the Hungry Mindguides students through an exploration of Shakespeare, his plays, and the Renaissance period in which they were written. Author Amanda Murray’s goal is to make Shakespeare come alive for students and to help them develop an appreciation for these works and their importance, even in modern times. This course accomplishes this through interaction, information, and activities that are laid out for a suggested five-week study plan. 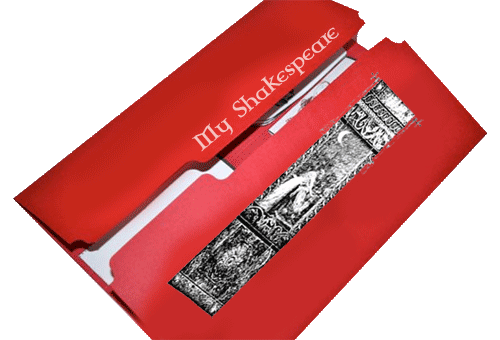 It does not require students to read any complete plays, although they will read excerpts. Murray also recommends that students watch videos of one or more of Shakespeare’s plays. A parent or teacher can select from among many of the learning activities, although some are essential. The study can be used with either one student or a group, but the more interaction the better. The course is presented in four chapters with a fifth chapter that helps you plan how to utilize the course and its components. (A customizable course schedule is available through the course website.) Each chapter begins with a page to the instructor with preparation requirements and suggestions. Each of these four chapters ends with a page titled “Discussions & Assessments” that intermixes discussion questions, further research assignments, projects, and composition work. Parents or teachers can choose which of these to have students complete. Chapter 2, Who Was Shakespeare, explores Shakespeare’s biography, including theories that identify other people as the author of Shakespearean works. This chapter is also followed by games, activities, discussions, research, and writing. Unless you want students to explore authorship rabbit trails, this chapter might take less time than others. Shakespeare’s Language, the third chapter, compares Old English to Middle English and Modern English. Students then learn about iambic pentameter, the poetic style used by Shakespeare in much of his work. A large section of this chapter is about “Secrets to Shakespeare’s Language.” Here students learn very helpful linguistic clues in Shakespeare’s writing such as his use of capitalization within sentences in his original works to signify words for actors to emphasize. Students are also provided with lists of words created by Shakespeare and famous phrases that are commonly used today outside of their Shakespearean context. This section has activities that challenge students to practice reading Shakespearean lines, trying to understand the clues left by Shakespeare as to his characters’ personalities, feelings, and mode of speaking. The fourth chapter, Shakespeare’s Approach begins with a brief study of Aristotle’s Poetics and the structure of drama. (A brief video on Aristotle’s Poetics, linked through the extra resources on the website, is very helpful for this section.) Students also learn about five-act play structure, tragedies, comedies, and history plays. Don’t be put off by the inclusion of some study of Poetics; this is included as a part of a basic introduction to the essential elements of a play and is very easily understood. Games, activities, and discussions at the end of this chapter include some interesting applications such as identifying the five-act structure in a fairy tale, identifying Aristotle’s six elements in a children’s storybook, or figuring out how to change a modern-day tragedy into a comedy or vice versa. When you purchase the book, you receive a password to access the website page with resources that support each chapter. These include lists of movies plus links to videos, articles, and activities. While these are optional, you should look through them to decide which ones are useful. At the end of the book are templates for creating some elements of a lap book for this study, but you will probably want to purchase the Why Shakespeare? Indeed! Lap Book Kit if you choose this activity. This study seems ideal for high school students. Parents and teachers without a background in Shakespeare should be able to teach the study easily enough, but they will need to do more preparation for each chapter than would someone already familiar with Shakespeare. In the five or so weeks it takes to complete the study, students are unlikely to have time for thorough study of any one play. It would be great to follow this course with focused study of one or more of Shakespeare’s plays, giving students an opportunity to immediately apply what they have learned at a deeper level.